STEM educators are always looking for ways to spark interest in students, especially those who may not already have a strong interest in STEM fields or may not view themselves as scientists or engineers. It is outstanding when educators find opportunities to expose students to activities that allow them to apply their learning in their own way. In working with middle school students in my STEM class, I have found that students love the opportunity to be creative and inventive. Students have been especially engaged when allowed to apply their skills while using Makey Makeys, Arduinos and Raspberry Pis. With these tools students are encouraged to embrace the process of innovation and creation, rather than focus on their end product. A large part of the assessment of learning is also based on the process over the end product. Focusing on the process of creation and innovation has really allowed for the students who have usually been averse to risk taking in an academic setting to try things that are new to them. For example, during a “maker education” project I had a student using a Raspberry Pi to create a “Magic 8 Ball” type game. Her programming experience was limited to Blockly style coding, and she had never worked with a Raspberry Pi or wiring of any type. The first few days of the project she hit many walls and wanted to give up and try something that she thought would be “easier.” Even though she found the project interesting and was doing a good job troubleshooting on her own, she frequently brought up her fear of not earning a “good grade” if it didn’t work. She reluctantly kept trying when I was able to convince her that her grade would not suffer if it didn’t work, that I truly was grading her process, and that even out of her perceived failure there would be learning. In the end, she not only had a working “Magic 8 Ball” but she also had grown in her ability to persevere and find value in the effort that goes into trying something new. 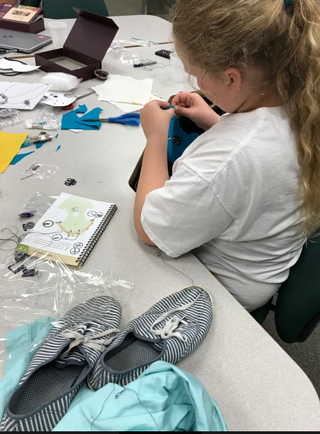 Through SparkFun’s Community Partnership Program, I recently had the opportunity to use the LilyPad Sewable Electronics Kit to engage some of my middle school girls in electronics activities. The students were eager to spend some time after school combining their knowledge of circuitry and sewing into a unique creation. As they opened the kits they were excited with the possibilities that were laid out for them. Some of the girls wanted to take on the larger challenge of creating the light-up mask, while others wanted the gratification of finishing the project in the time we had set aside to meet after school. Given that the students had never encountered a sewing project of this type, I was very pleased to see their willingness to jump right in and start working. They found the kits and directions easy to use and, more importantly, were able to troubleshoot with each other when problems arose. As they worked they were already looking for ways to improve and enhance their next designs. An hour and a half flew by, and the girls who had chosen to do the light-up pins were thrilled to leave with their completed creations. 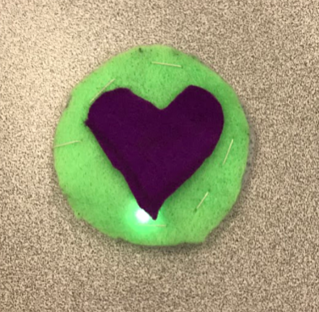 While this was my first experience incorporating sewable electronics, based on the level of engagement from my middle school girls I will definitely be looking for ways to expand opportunities for my students to get their hands on conductive thread! I am always asking my students to take risks, try new things and embrace the process of learning. But I think that, as educators, we also must model these actions for our students. It is not always easy to try something new and to risk not having the answer in front of students. As the opportunities in “making” with electronics continue to expand, I am forced to model the process of learning frequently with my students. As a former math teacher, I have made the transition from having the answer, or knowing exactly how to find it, to often saying to my students, “I am not sure, but we can figure it out together.” I am being honest when I say the second response leads to much more fun in teaching! Erika Myers is a STEM teacher, who loves learning, watching others learn, making and technology education. 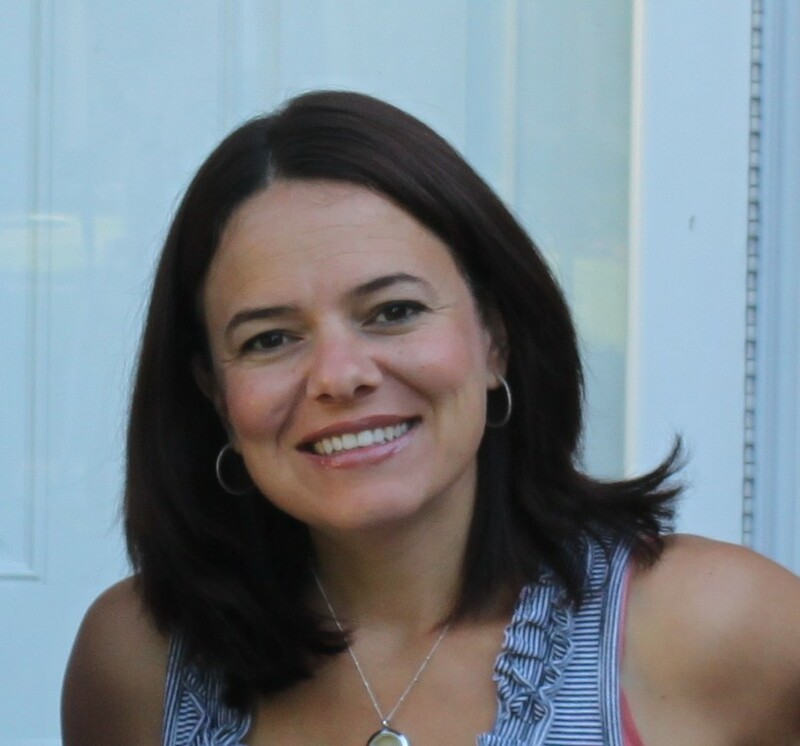 She spent the first 11 years of her teaching career as a math teacher, and the past five years she has spent creating and teaching a middle school STEM curriculum that focuses on physical computing, electronics, making, robotics, rocketry, 3D design and alternative energy. Erika is invested in finding something to spark each student’s interest so that they can apply and further develop that knowledge in the future. She has presented on incorporating Makey Makey and Scratch in the classroom, as well as makerspaces and STEM labs. She was chosen for the 2017 Northrop Grumman Foundation Teachers Academy Fellowship.